Rumi was born in what is now Afghanistan in 1207, but most of his life was in Persia and Turkey, where he wrote..voluminously. He was a jurist, a theologian, and a Sufi mystic who influenced writing in the Middle East for centuries and has become popular (and accessible) in the West through translating and paraphrasing in modern vernacular languages. Sufism is a subset of Islam. (I’d call it a cult of Islam, but that word has become so loaded with negative meaning by many commentators that I resist its use.) Sufism is, let’s say, a mystical subset of Islamic beliefs, as Zen Buddhism is to Buddhism, as Kabala is to Judaism, or as Yogaism is to Hinduism. Mystical Christianity also flourishes, and- I believe- has been a primary vehicle for moving The Way of the Christ through the centuries, in its most well-preserved forms. All of the world’s mystical traditions look toward the revelation of God around them (which is precisely what Jesus stated again and again is what he wanted to do: reveal God the Father). Looking deeply for God requires discipline; the practitioners of the mystical disciplines are drawn to them by the unquenching and relentless and often uncomfortable desire to know more about God. And what they learn, or experience, is often difficult to communicate to others. The “previously known” boundaries of what they knew about God begin to blur, even dissolve! There is a unity of all things that defies much of the language we have available to us as humans. Some will attempt to describe the Light they have perceived in poetry, or in painting, or even in dance. 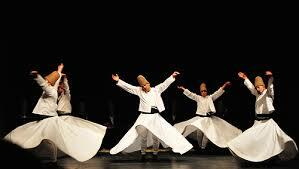 The Sufis like to dance. 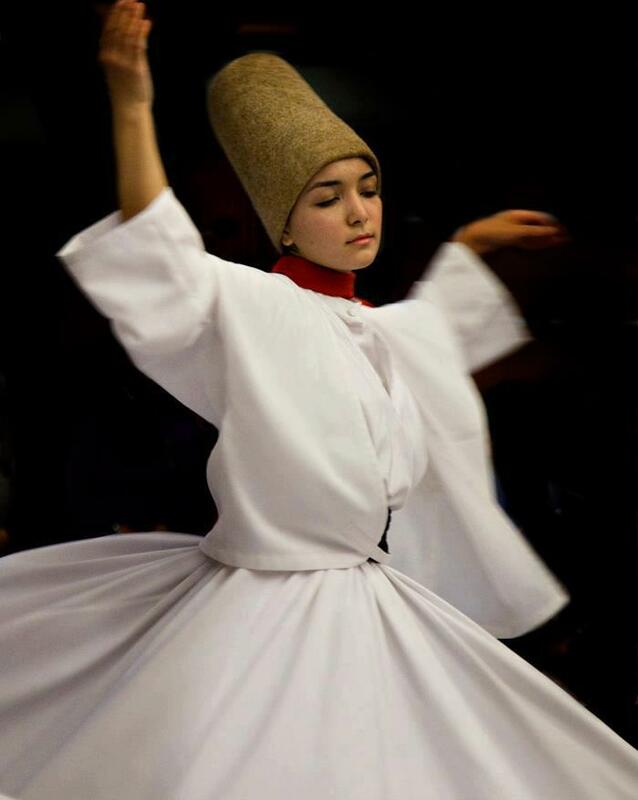 I don’t know if Rumi himself was a Dervish dancer, but he would have experienced them often because even the watching of the dancing is participation in it. Spinning in ectasy. Notice the hands: One hand is up and open for receiving from God, the other hand is holding and giving, sharing God’s blessings received, to others. The headpieces represent tombstones of their individual egos. But we do know Rumi wrote poetry- reams of it. And that poetry, now accessible to Westerners (primarily in America through the paraphraser Coleman Barks), has made Rumi a favorite of all who seek a more intense experience of the Light. It is the Light which I understand as Christ, which is how the gospel of John describes Christ in its first chapter). Forget your life. Say God is Great. Get up. You think you know what time it is. It’s time to pray. You’ve carved so many little figurines, too many. Don’t knock on any random door like a beggar. and no one says How aren’t you? of walking in the noisy street and being the noise. Drink all your passion, and be a disgrace. Close both eyes to see with the other eye. Open your hands, if you want to be held. Quit acting like a wolf, and feel the shepherd’s love filling you. At night, your beloved wanders. Don’t accept consolations. Close your mouth against food. Taste the lover’s mouth in yours. You moan, “She left me.” “He left me.” Twenty more will come. Be empty of worrying. Think of who created thought! in always widening rings of being. 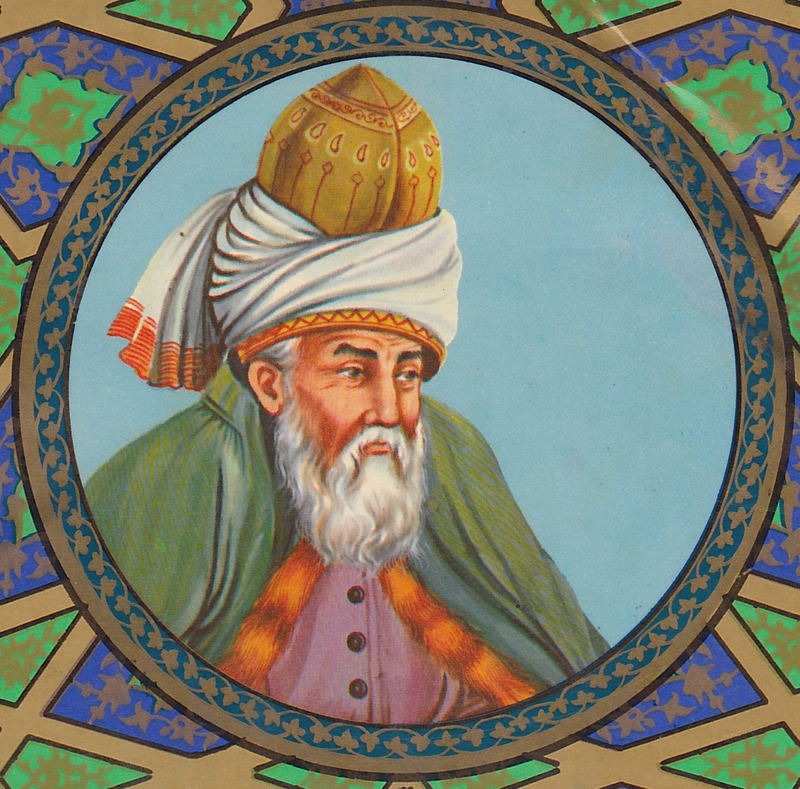 Many of Rumi’s poems are not so easily understood at first. In that regard they are like Zen koans; they open the door to contemplation and thought on “heavenly” things or, at minimum, thoughts outside of one’s own jabbering ego-mind. So, call them poems of Sabbath, of rest and reflection.